I’ve heard it from all of you, so let’s not even do the whole “Haha Dylan, the Sonics aren’t there anymore” or any different version of the joke. Let’s call this a fun, fantasy squad. A fantasy squad of players currently on NBA rosters, all who either attended high school or college in Western Washington. This fantasy roster is very doable, seeing as there’s 16 players in the league right now, so I’ll give you my starting five, seven bench players, three roster inactives, and a coaching staff. You can tell that these two guys out of Tacoma (Isaiah Thomas, left, and Avery Bradley) are psyched to be on this roster! Right off the bat you know where the scoring is coming from — the backcourt. Thomas is coming off a season in which he averaged 23 points and six assists per 36 minutes in his time with the Suns and Celtics, and Wroten averaged 20 points and six assists per 36 in a 30-game, injury-shortened season with the Sixers. If Thomas and Wroten are able to drive and dish, guys like Ross and Williams will be able to shoot (with help from other shooters on the bench). 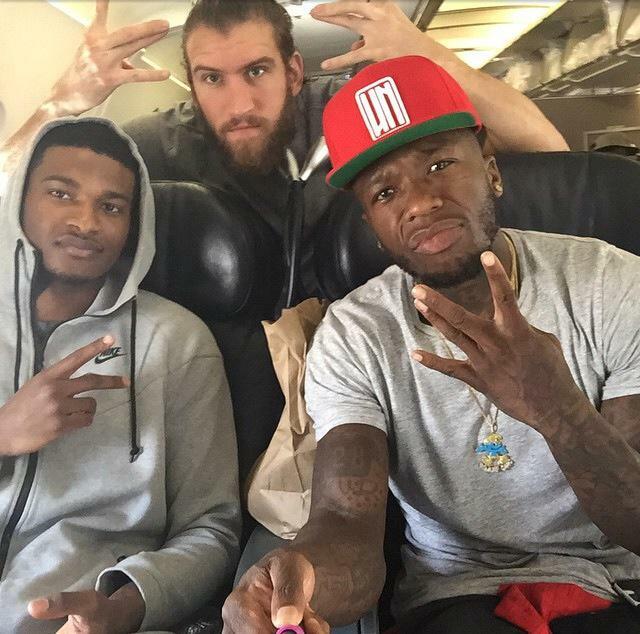 The problem with this team is going to be apparent from the outset — no depth in the frontcourt. May have to ask Spencer Hawes to play a career-high in minutes per game (his previous high was 30.9 in 2013-14 as he split time with the Cavs and the Sixers, and this past year the Clippers played him only 17.5 minutes in the regular season and a measly seven minutes per in the playoffs). Marvin Williams may also need to play close to 30 minutes a game because as you’ll see in a moment, this bench does not have many guys to spell them without going very small. See guys! I won’t even have to put much effort in — the roster is already coming together on its own! I was tempted to insert Jamal Crawford into the starting lineup – a temptation that has surely haunted his coaches for years – but he’s proven he’s reliable coming off the bench throughout his career and his still getting it done today. But as great as Crawford is, he’s an example of the gift/curse of this team: so many guards, so few big men. Which is why I’d play a lot of three-guard and maybe even four-guard lineups, spreading the floor with shooters like Wilcox, Holiday, Brooks, and Ross. I’d also more than likely have two guys on the floor at all times who are capable of running the offense/the point i.e. Brooks, Thomas, and even Wroten. I can very much envision a scenario where Avery Bradley is able to stay healthy, perform well in practice, and earn a chance to suit up. Nate and Jason Terry however made the squad to help team chemistry and provide veteran presents. I was working my way through each team’s coaching staff as desperation and failure were setting in. I had worked my way through almost every NBA coaching staff without finding a coach who had attended high school or college in western Washington. I had amassed a few former Sonics players and coaches and was prepared to go down that route if need be, and then I came to the Jazz. Quin Snyder, the first-year Utah Jazz head coach, attended Mercer Island High School. He will be our head coach and he’ll be joined on the bench by Spurs assistant Chad Forcier, an alumnus of Rainier high school (south of Olympia), and former Sonics player, assistant, and head coach Bob Weiss. I’ve also convinced Luke Ridnour to retire and join the coaching staff. There may not be a professional basketball team that plays in the Emerald City anymore, but the NBA is littered with UW alums and players who went to high school in Seattle, Tacoma, and everywhere in between. While I was watching an NBA game recently – I believe it was the Phoenix Suns at the Minnesota Timberwolves in Minneapolis on ESPN – a thought occurred to me, “There sure are a lot of brothers in the NBA.” When watching the Suns, it’s hard not to have this thought occur to someone, as Phoenix features the Morris twins, the Dragic brothers, and two other players with brothers in the NBA (Tyler Ennis and Miles Plumlee). It didn’t take long to discover there are currently eight different sets of brothers with both siblings on active NBA rosters. I will now rank them from worst to best because that’s what we do. We make lists sorted by quality. All statistics are courtesy of ESPN.com and include games played on Sunday, January 11, 2015. If you have any question on the meaning of any of the advanced statistics located in each brothers’ second stat box, a key with explanations is located at the bottom of the page courtesy of ESPN.com. The Smiths (J.R. and Chris), the Antetokounmpos (Giannis and Thanasis), the Teagues (Marquis and Jeff), the Griffins (Blake and Taylor), the Pargos (Jeremy and Jannero), the Landrys (Marcus and Carl), the Thompsons (Klay and Mychel), the Currys (Steph and Seth), the Collinses (Jason and Jarron), and the Hansbroughs (Tyler and Ben). 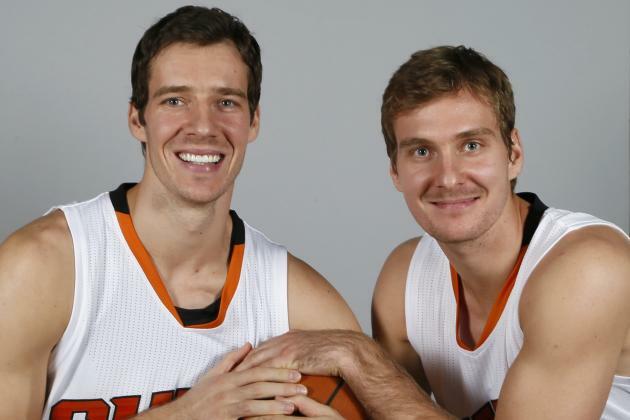 (From left, Goran and Zoran Dragic). MAN THESE GUYS LOOK LIKE A REAL FUN PAIR OF DUDES. Photo credit to Matt York/Associated Press. This pains me because I’ve loved Goran Dragic ever since he had a spin move–>lay-up to get past Kobe in the playoffs. He subsequently left Phoenix, came back, and is now one heckuva player. Somehow, his brother has made it into the NBA. And yeah, he’s barely playing, but he is on an active roster. Wait a second, Paul Millsap has a brother? And he plays in the league? As if that wasn’t enough, he’s playing for Paul’s old team, the Jazz. Oh right, Paul’s a solid player now and his Hawks are the best team in the Eastern Conference and they’re also red hot. Elijah’s barely played though, and he ain’t done a whole lot yet, so he’s dragged his brother down to No. 7. 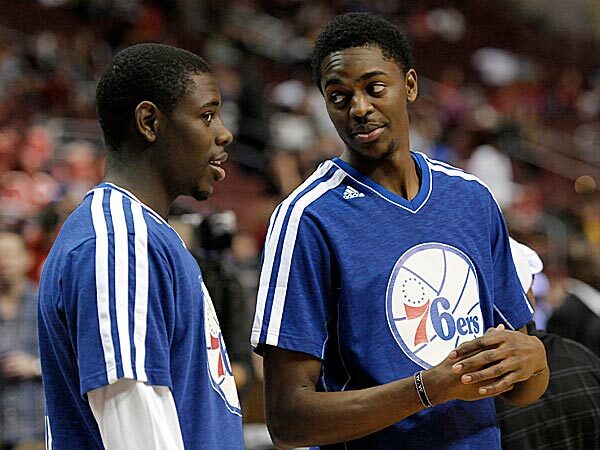 In the dying stages of the 2012-13 season, Jrue, left, and Justin Holiday had the opportunity to play together on the Philadelphia 76ers. Photo credit to Michael Perez/AP. This may be the only brother duo who are both playing above-average basketball this season. Justin went to UW, which I obviously love, but he’s gotten a chance to use his shooting prowess to contribute to the Warriors’ early season success this year. His brother Jrue is having arguably the best season of his career and has been teamed up with MVP-candidate Anthony Davis as the New Orleans Hornets’ best players. 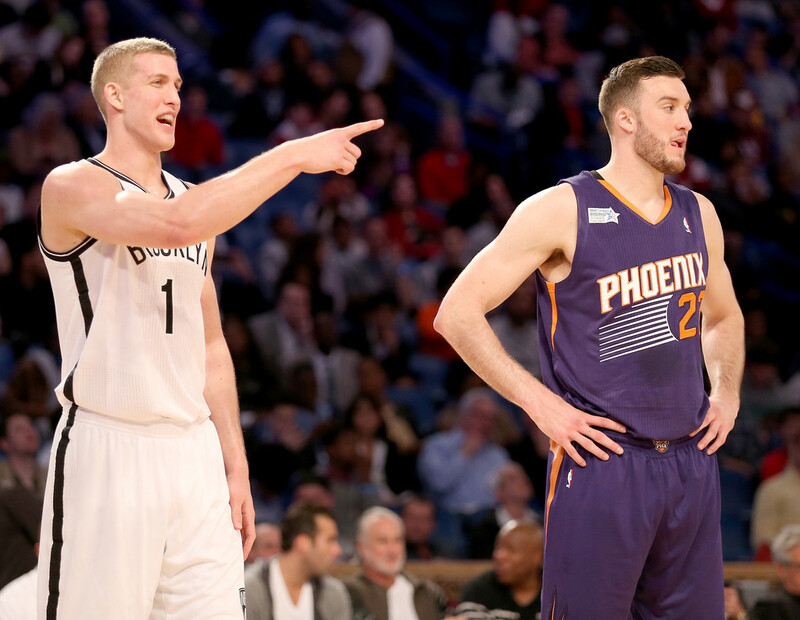 Once teammates at Duke, Mason, left, and Miles Plumlee are now making a mark in the NBA playing on opposite coasts. Photo credit to Christian Petersen/Getty Images North America. The damn Plumlees. They feel endless, don’t they? And of course Marshall is still at Duke, but I don’t think he’ll be playing in the Association. Miles has seen his PER drop slightly from last year but he’s still cleaning the defensive glass pretty well and his suns may end up making the playoffs in the always difficult Western Conference. Miles’ brother Mason has been the best player on a Brooklyn Nets team that is the currently 2nd in the Atlantic Division and could also end up in the playoffs. Cody Zeller, left, is seen here defending his brother Tyler in an April 2014 game. Though Tyler is no longer with the Cavaliers, both players still have significant potential in the NBA. Photo credit to Mark Duncan/AP. Of all of our brother pairs, these two may have the most potential. Cody is getting a chance at legit minutes in Charlotte for a Hornets team that may sneak into the playoffs. Now that he’s out of Cleveland, Tyler is working to establish himself as part of Boston’s core for the future and with a third straight year of increased PER, he may be doing just that. 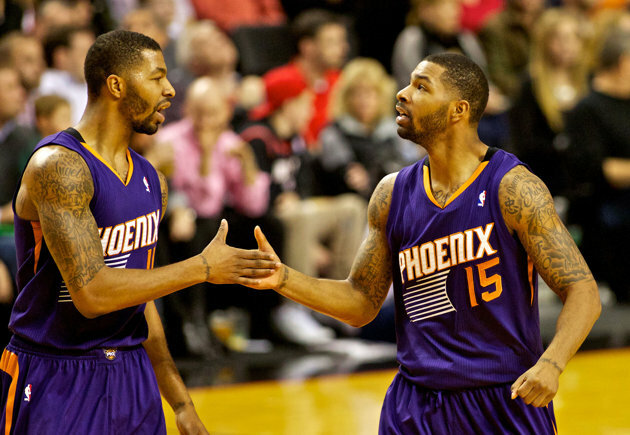 From left, Marcus and Markieff Morris. The deep shooting big men are part of a talented roster in Phoenix. Photo credit to USA Today. Though they finish third on this list, Marcus and Markieff are second among identical twins. They’re also unique in their roles as 3-point shooting big men. Both could use some more development in the discipline department, though I’ll be the first to admit I may have Marcus mixed up with Markieff or vice versa. (Just checked the boxscore of the game I had in mind and guess what — they both got T’d up). Their Phoenix Suns squad is nothing if not unique and these two are front and center. 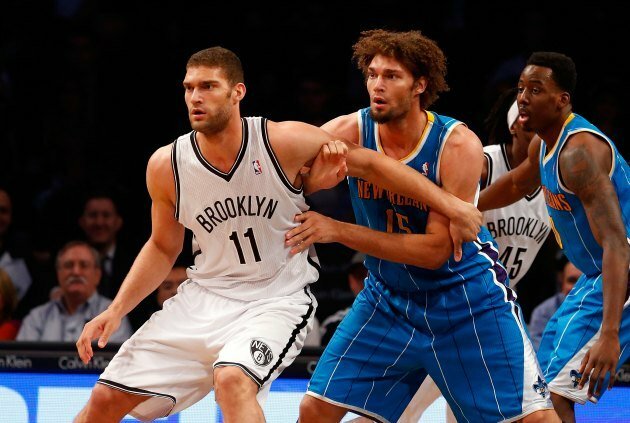 Brook Lopez, left, is defended by his brother Robin in a March 12, 2013 game. Robin has since departed New Orleans, but he and his brother make up the best pair of twins in the NBA today. The twin seven-foot centers from Stanford, the Lopez brothers are in their sixth year in the league now and are one of only three brother pairs in the NBA of which both brothers have above-average PERs. However, Robin will be out for another month or so with a broken hand suffered in mid-December, so it is up to Brook to carry the load — something he has done well so far this season as one of the Nets’ best players. 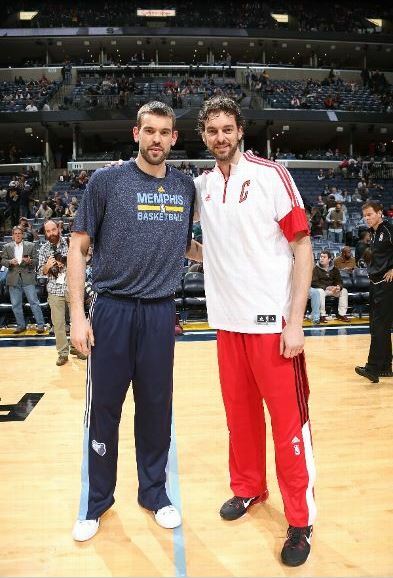 Prior to their game on December 19, 2014 in Memphis, Marc, left, and Pau had a chance to pose together for a photo op. The Gasol brothers are the best pair of brothers in the Association today. Photo credit to Joe Murphy/NBAE via Getty Images. The Gasol brothers — two seven-foot tall Spaniards. Pau, a former third overall pick who is now 34, and Marc, who was taken in the late 2nd round in 2007 and is now 29. Back in February 2008, Pau was sent to Los Angeles by the Memphis Grizzlies in what is arguably the worst trade in NBA history. However, Marc has developed into one of the premier centers in the NBA, earning an All-Star selection and Defensive Player of the Year in 2012-13. Moreover, both players are part of teams that are among the class of the league at the moment. Because of all this, Pau and Marc Gasol are the best pair of brothers in the NBA today. Thank you for embarking on this venture with me! I hope you enjoyed it as much as I did! It all started on December 20 with the R+L Carriers New Orleans Bowl and 36 games later, the bowl season has concluded. For the sake of this look back, I’ll be excluding the two semifinal games — the Rose Bowl and Sugar Bowl. Even without the games in Pasadena and (the New Year’s Day one in) New Orleans, there were still plenty of noteworthy performances and footballing displays. There’s a first time for everything, and 2015 gives us a first of sorts in American sports. The National Championship game for the highest level of college football is a much closer approximation to what a championship game should be, thanks in part to the fact that the teams were not selected by biased voters or by computers but by a well-informed committee. This closer approximation is also due to the fact that the two final teams came from a group of four, having to win a semifinal matchup to reach their last game. I’ll do my best to provide you with every piece of information you may want as it concerns the 2015 College Football Playoff National Championship. Six bowl games remain upon the conclusion of New Year’s Day, and only one game features ranked opponents. With four NFL playoff games taking place this weekend – and the FA Cup, obviously – four of the remaining six will take place Friday. I’m going to try and breeze through these a bit because this train is coming into the station with decidedly less fanfare, outside of the College Football Playoff of course. Oh, and I’ll be out of town over the next (almost) two days. Oh, and it has been darn difficult to look away from these fantastic bowl games today. Amon G. Carter Stadium (Fort Worth, TX). Radio: RedVoice LLC (Brian Estridge, John Denton, Rob Best, and Landry Burdine). Current odds: Pittsburgh by three with an over/under of 53.5. This is it. Long discussed all season long – and in hypotheticals for decades before – the first ever College Football Playoff has arrived. Two games played on New Year’s Day, and we’ve got everything you need to know. No. 2 Oregon Ducks (12-1, 9-1 in Pac-12) vs. No. 3 Florida State Seminoles (13-0, 8-0 in ACC). TV: ESPN (Chris Fowler, Kirk Herbstreit, Heather Cox, and Tom Rinaldi). Radio: ESPN Radio (Sean McDonough, Chris Spielman, and Todd McShay). Series History: This will be the first ever game between Oregon and Florida State. …in which we look at six games that are all matchups between ranked teams, three that will take place on New Year’s Eve, and three on New Year’s Day. TV: ESPN (Joe Tessitore, Brock Huard, and Shannon Spake). Radio: ESPN Radio (Dave Neal, Andre Ware, and Laura Rutledge). Series History: This will be the seventh meeting all-time between the Rebels and Horned Frogs, with Ole Miss leading the series 5-1.